The Kodiak kit is back in production as the Kodiak Master Grade Kit, that also includes the Cockpit and Heavy Weapons Upgrade kits. Introduced in the final two cycles of the War of the Alliance, the Kodiak was the sum of Northern engineering, concentrating massive firepower in a mobile package. It featured thick armor, especially on the front, and the armor skirts overlapped for additional protection. The engine and transmission were designed to help the Kodiak carry its heavy weapons and armor plating load. The communication system was also state-of-the-art, giving it improved range, and a laser sensor system was installed in a lengthened head housing. This Gear was a massive beast, standing 5.2 meters tall and weighing in at over ten tons. The armament, which is already heavy on the standard Grizzly, became truly monstrous on the Kodiak. The Kodiak was first introduced in Spring of TN 1916, when it was used to good effect against CEF incursions into Northern territories. Its success against hovertanks quickly became a morale-boosting military legend and the rare Kodiaks were wrapped in a mystique of invulnerability they only partially deserved. Since the signing of the Treaty of Westphalia, the Kodiak has remained in service as a prestige unit. Still quite rare because of its elevated production cost and high maintenance requirements, it is sought after to add a certain mystique of invulnerability to a regiment. Because of these features, the Kodiak was a natural choice to be the first Gear to be translated into model kit format. The standard military model 1/35 scale was chosen both to provide an impressively large piece and to allow modelers to use parts from the large plastic armor kit collection that already exists at this scale. The model is cast in a plastic-like, high quality resin to hold a maximum of details while still remaining easy to work with. Great pains were taken to ensure that the casting of each part is done as cleanly as possible, reducing the modeler's work load and preserving the intricate surface detail. The Kodiak model is composed of over 70 individual parts, allowing the modeler to choose from a wide range of postures for the finished product. Assembly is extremely simple: many parts are joined by coded pins and plugs, ensuring each part fits perfectly in its intended position and nowhere else. 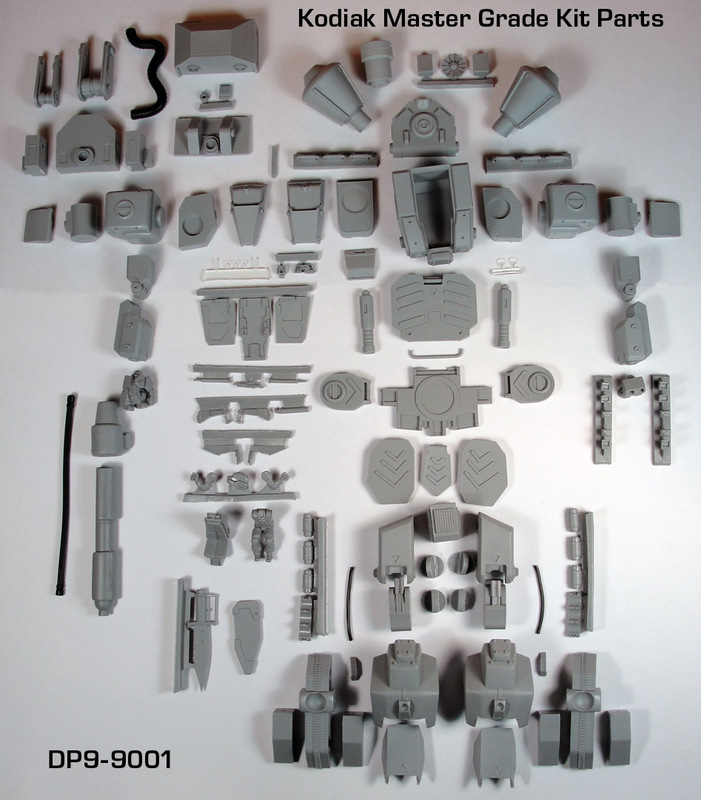 The sculpting of this kit was done with great attention to the smallest feature, such as the details of the sensor plates, drive treads or the complex twin-thumbed manipulator units. Even the skin features the correct discrete armor cast pattern. The cockpit cavity has a two-piece hatch and stands ready to receive the Cockpit Upgrade Kit. 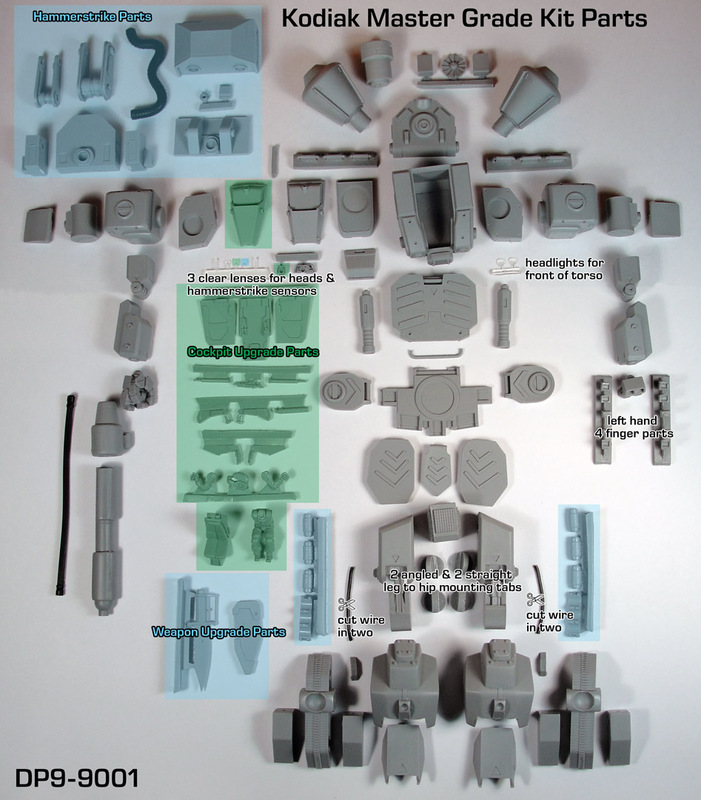 It also contains the lengths of tubing and wire required for the main weapon, power train and other high detail areas. Comprehensive and well-illustrated instructions and painting guide are included, leaving no guesswork to the modeler. The final result is a finely crafted kit that exactly reproduces the fearsome aura that has always surrounded this most popular Heavy Gear® combat machine. The Cockpit Upgrade Kit including a four-piece pilot with an accurate CNCS combat uniform and helmet. Assembly is extremely simple: many parts are joined by coded pins and plugs, ensuring each one fits perfectly in its intended position and nowhere else. The Weapons Upgrade Kit including the Hammerstrike Missile Launcher, Vibro Blade and Grenades. Assembly is extremely simple: many parts are joined by coded pins and plugs, ensuring each one fits perfectly in its intended position and nowhere else. Click here to see a larger version of the parts photo and click here to see the same larger version parts photo with the upgrade parts color coded and with notes.